Silver Award « Girl Scouts of Gulfcoast Florida, Inc.
A new year means new groups of girls are setting their sights on Girl Scouting’s highest awards. For Cadettes embarking on the Silver Award, this means beginning to step outside Girl Scouts and looking for ways to serve their greater communities. Though the Silver Award process, girls learn how to make connections and listen to others’ perspectives, perhaps incorporating these new ideas into their project. The Silver Award allows Cadettes to design their own community project and understand how they impact their community as a leader, learning from the trials and tribulations they may experience. Girls may work with a small group of other Girl Scouts or lead a project themselves. Two examples of Silver Award projects recognized in 2016 include The Selfie Project (boosting girls’ self-esteem), and Cat Cause (supporting local animal welfare organizations). There are so many worthy causes and much-needed projects – the possibilities are endless! The first step toward earning the Silver Award is for the Cadette and her project advisor to participate in a workshop hosted by the Girl Scouts of Gulfcoast Florida. Dates for online workshops are being finalized with more to come as we prepare for the new school year. To date, workshops are scheduled for Sunday, September 18 and 25 at 5:30 p.m. If you have any questions or have a Girl Scout who is eager to begin prior to these workshops, please contact Shannon French (shannonf@gsgcf.org or 800-232-4475 ext. 326) to ensure all guidelines are followed, and any necessary forms are completed. Girls may also request an in-person workshop at council headquarters. –Shannon French is a Program Specialist for Girl Scouts of Gulfcoast Florida, Inc.
Hi, I am Olivia, a member of Girl Scout Troop 16 in Bradenton. 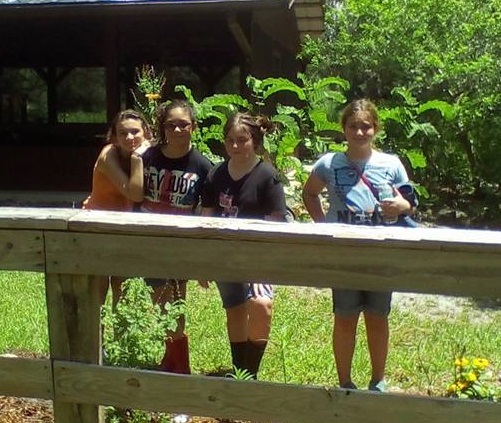 As our Girl Scout Silver Award project, my troop restored the butterfly garden at the Crowley Museum and Nature Center. The Silver Award has very specific qualifications and is one of the highest honors a Cadette Troop can earn. One of the main qualifications is to pick a project that has a lasting impact on the community with a commitment of at least 50 hours of service time. At one time or another, all my troop members assisted in the project. In December 2014, we began with a trip to Selby Gardens for a private tour. We met with the caretaker of their butterfly garden to learn the basics of maintaining a healthy butterfly garden, and to get an idea of what Florida native plants we could use. We learned to use plants that sustained the larvae population. Selby provided us with a list of butterflies and butterfly-friendly plants, and the list was very useful in deciding what plants we wanted to use and what was native to Florida. We designated a portion of our cookie booth proceeds to fund the project and in March 2015, we started clearing the area with only gloves, a shovel, and two spades. With our modest amount, we purchased the few plants we could and planted them, but there was still much more work to be done. That is when I applied for a grant from the Serenoa Chapter of the Florida Native Plant Society. Because of the generous grant we received, we were able to purchase more tools and many more plants so that we could complete the project before the heat of summer kicked in. Some of the plants we planted were Prostrate Porter weed (Strachytarpheta jamaicentis), Tropical Sage (Salvia coccina), Black-eyed Susan (Rudbeckia hirta), Firebush (Hamelia patens), Wild Coffee (Psychotria nervosa), and Giant Ironweed (Vernonia gigantea). We purchased our plants from both Florida Native Plants and Crowley nurseries. Cadettes from Troop 16 (left to right): Olivia, Emily, Sydney, and Delaney. We are proud of the work we accomplished and are committed to maintaining the butterfly garden throughout the years. We could not have accomplished this without the help of the Serenoa Chapter of the Florida Native Plant Society and all the people we met along the way who took the time to educate us. Most of all, we thank our parents and our leaders, Antoinette Yagy, Suzanne McLauchlin, and our mentors, Gerald Yagy and Mike Amado. Be sure to check out all the pictures we posted on the Serenoa Chapter’s Facebook page! We encourage everyone to come out to Crowley Museum and Nature Center and enjoy the peacefulness of the gardens and the beauty of nature! Editor’s note: This article first appeared in the Sept. 2015 newsletter of the Serenoa Chapter of the Florida Native Plant Society, and is shared here with their permission.